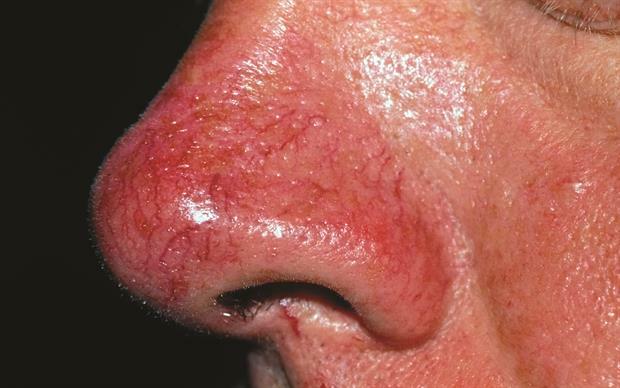 This 55-year-old male patient had a six-year history of rosacea, manifesting as facial redness, which was intermittent at first, but had now become more fixed. It was exacerbated by warm weather, embarrassment and consumption of alcohol or spicy food. He also described intermittent flushing episodes for the past four months, related to changes in ambient temperature. 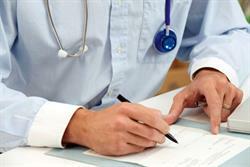 The patient's facial redness was affecting his work, particularly in face-to-face meetings. He was otherwise well and was taking oral lymecycline daily for his rosacea. Examination revealed a generally red complexion on the upper and middle face, with telangiectasia around the nose and central face. There were no papules, pustules or evidence of inflammatory dermatoses such as eczema or psoriasis. 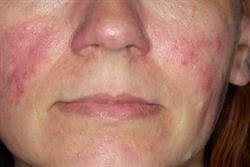 In the absence of inflammation, facial redness usually represents erythemotelangiectatic (type 1) rosacea. Seborrhoeic dermatitis is an important differential and may coexist. The pathogenesis of facial redness is not fully understood, but antimicrobial peptides with pro-inflammatory and angiogenic effects, such as cathelicidin LL-37, are thought to play a part in the aetiology. These are induced by injury, such as sunlight exposure, and by vitamin D. There is also evidence that the Demodex mite and the bacterium it carries have a significant role in rosacea. Neurovascular function is key to the vasodilation and flushing seen in type 1 rosacea; there is upregulation of capsaicin receptors in cutaneous nerves (with increased sensitivity to spicy food) and increased activity of VEGF-A, correlating with increased skin vascularity. 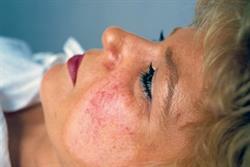 Patients with facial redness often have 'sensitive' skin, which easily becomes red or flushed. 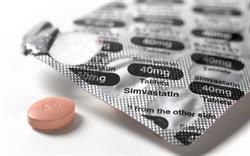 The stimulants for redness include physical and psychological triggers, such as rapid changes in temperature, sunlight, exposure to cold weather and psychological stress. Ingested triggers include alcohol, hot/spicy food, caffeinated drinks and citrus fruits. Often, such patients experience a 'burning' sensation when topical products (including emollients) are applied to the skin. This patient's treatment was continued with oral lymecycline to maintain control of the papular and pustular component of the rosacea. Additional options were considered for both the recent onset flushing and the fixed facial redness. Initial treatment for the flushing was 100 microgram oral clonidine three times per day, rising after three to four days to 200 microgram three times per day. 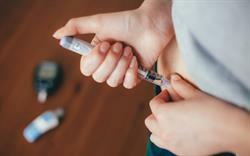 The aim was a maximum 1,200 microgram per day in three divided doses, but the side-effect of a dry mouth prevented him from taking more than 200 microgram three times per day. He was prescribed topical brimonidine gel for intermittent treatment of his fixed facial redness, and recommended to have pulsed dye laser treatment for the telangiectasia. Treatment choices for facial redness have been fairly limited until recently. Despite being effective in papulopustular rosacea (type 2 rosacea), oral and/or topical antibiotics have little effect on the facial redness of rosacea. Previously, the main therapeutic options for facial redness were physical treatments, such as vascular-specific pulsed dye laser or intense pulsed light. These can bring long-lasting improvement, but are costly and can be painful, causing temporary bruising or occasionally, scarring. Systemic agents acting on the adrenergic system, including non-selective beta-blockers such as propranolol or carvedilol, may have a role in anxiety-related flushing, although they are rarely successful for fixed facial redness. Alpha-adrenergic agonists, such as clonidine or moxonidine, can also help in facial flushing by reducing sympathetic tone centrally, but often have troublesome side-effects, such as drowsiness and fatigue. 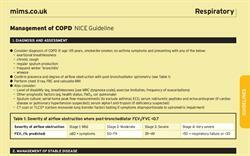 Clonidine in particular has to be used with care and dose escalation and reduction must be gradual. Topical agents, such as brimonidine and oxymetazoline, offer an alternative approach. Both are selective alpha-2 adrenergic agonists, acting as peripheral vasoconstrictors. A recently developed topical preparation of brimonidine 3mg/g gel has a formulation that allows effective skin penetration and provides temporary vasoconstriction in the skin. It reaches maximal effect after two hours and can lessen visible facial redness for eight to 12 hours. 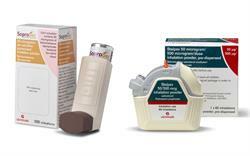 It has a low incidence of adverse effects or rebound vasodilation. However, it has little or no effect on telangiectasia or facial flushing. Most patients with facial redness from rosacea will need a combination of treatments, including oral antibiotics for papules and pustules, systemic vasoconstrictors for flushing, topical vasoconstrictors for facial redness and vascular-specific laser for telangiectasia.